Enfield is centrally located between the Royal County of Meath, seat of High Kings, and County Kildare, the home of the Irish Kings of Leinster. As such there are a wealth of stories and legends on our doorstep from where Ireland's rich cultural past can be explored. The Celtic Irish are among the world's oldest nationality groups. A small sample of some of the more familiar legends and important heritage sites to visit within a 30-mile radius of Enfield are described below. Legend tells the story of how the young Fionn Mac Cumhaill caught a Salmon on the nearby River Boyne with the power to give knowledge and wisdom to whoever first tasted it. While cooking it for his master Finnegas, he accidentally burnt his thumb on it and put it in his mouth, unwittingly taking the prize. This is the story of four children who were turned into swans by their jealous stepmother and who spent 300 years of their 900 year exile on Lough Derravaragh near Mullingar until the toll of a Christian bell released them from the spell. Lir's castle may have been on the site of Tullynally Castle in Castlepollard, Co. Westmeath (about 35 miles west of Enfield). Tullynally is the anglicised form of "Tullach na n-eala" or "hill of the swan". St Brigid (450-525AD) is said to have been a woman of God and of the people and was known for her generosity to the poor. She is said to have established convents which schooled thousands in the Christian faith all over Ireland in the 5th Century. About 25 miles south of Enfield lies the town of Kildare, the capital of Ireland's bloodstock industry, and the nearby Curragh plains, an open area of some 5,000 acres of rolling grassland. Legend tells that Brigid went to the parsimonious King of Leinster looking for some land for a convent and got him to agree to give her only the land that her cloak would cover. When she laid her cloak on the ground of the Curragh, by a miracle it is said to have expanded in all directions to cover several acres. A sculpture symbolising the inextinguishable flame of St. Brigid's Fire stands in the medieval market town of Kildare since 2006 where many other heritage sites may be seen as well as the nearby Japanese Gardens, National Stud and Curragh Racecourse. The game of Fichille (Fáth+Ciall 'Learning and Intelligence' or Fid+Ciall 'Wood and Intelligence'), the archaic boardgame described as a game of kings, is a battle game of two sets of figures on a square board divided into black and white squares, is said to have been developed, popularised and spread from Ireland. The game also developed in parallel in the East (probably both from a very old Egyptian or Mid-Eastern root) and spread through Persia (Iran), India and China. Chess became known in central Europe by 1100-1200AD, perhaps carried by Irish Scholars. It is known to have been played in Ireland in the second century because two chess tables were bequested in the will of High King Cathair Mór who died in 153AD and it is the Western version that appears to have developed to be more like the modern game. A 12th Century carved figure of a queen from a chess set was found in a bog in Clonard around 1817 and is held in the National Museum. The invention of Fichille, which may have led to the Western version of Chess, is attributed to King Lugh of the Tuatha Dé Danann, spiritual father of Cúchulainn according to the 11th century text "Cath Maige Tuired". This would mean (if you were to believe the dates chronicled in the 1st Volume of the Annals of the Four Masters) that a version of Chess was played in this part of Ireland as far back as the start of the 2nd Millenium BC. Legend tells that the ascendancy of Lugh began when he went to Tara to assist King Nuadha who had lost an arm in a battle with the Fir Bolg champion Sreng when the Dé Danann first laid claim to Ireland. Due to his formidable skills, strength and displays of talent he was admitted to Tara and King Nuadha eventually yielded his throne to Lugh, due to his physical perfection, in keeping with Tuatha Dé traditions. Lugh, bearing the irresistible magic sword called Freagarthach (the "Answerer"), and an invincible spear, successfully lead the Tuatha Dé Danann against the Fomorians (mythological enemies of the people of Ireland, perhaps pirates) at the Second Battle of Mag Tuiredh and killed their tyrannical one-eyed leader Balor (said to have had a fort on Tory Island and coincidentally Lugh's maternal grandfather), thus fullfilling a prophecy. Lugh is alleged to have cast a sling stone at him driving his evil poisonous eye into his head so that it saw its host and killed him. On the battlefield he is said to have spared the life of Bres, the half-Fomorian contender for the throne, on the condition that he teach the Tuatha Dé how and when to plough, sow and reap. The 30-day Lughnasadh festival is said to have been instituted by Lugh in 1829BC, (pre-dating the Olympic Games which began in Olympia in 776BC) as a funeral feast and ancient sporting event commemorating his foster-mother, Queen Tailtiu, who allegedly died of exhaustion after clearing the plains of Ireland for agriculture. The first location of the Áenach Tailteann gathering was at Teltown (about 25 miles north of Enfield) and the Tailteann Games ran annually until the time of the Norman Invasions when they died out. The Gaelic Athletic Association Stadium in Navan is called Pairc Tailteann. After the purchase of Croke Park in 1913, the Tailteann games were revived by the GAA in 1920s and 1930s before World War II. The feast of Lughnasadh, a harvest festival, is celebrated in Lugh's name on 1st August. On the western shores of Lough Ennell, about 30 miles west from Enfield, is a place called Lilliput, named in honour of Jonathan Swift who is believed to have found the inspiration there for the tale of Gulliver's Travels in 1726, from watching people at a distance across the lake in Belvedere. The area has been developed into the Jonathan Swift Park which features a Par 3 golf course overlooking the lake, a seasonal coffee shop, boat moorings, trout angling, swimming, woodland walks, and a children's play area. Jonathan Swift has associations with Trim where in 1700 he was appointed as Church of Ireland Vicar of Laracor, Agher and Rathbeggan before being appointed Dean of St. Patrick's Cathedral in 1713. A Swift Literary Festival is held in Trim each year. The Trinity Well is located at the foot of Carbury hill, about 7 miles from Enfield. Trinity Well is reputed to be the source of the River Boyne. According to the Legend, the secret Well was in the garden of Neachtain, a mythical King of Leinster, and its water had magical powers of wisdom. Anyone who approached it other than the King and his cup-bearers was instantly deprived of sight. The water derived its wisdom from the fruits of the nine Hazel trees that grew around it. The nuts were eaten by salmon who lived in the well and took on the qualities of wisdom. Queen Bóann (from whom the river gets its name), was determined to sample the water, so she performed incantations and broke the charm of the well. The spring then rose in enormous waves, mutilating her and blinding her and pursued her until she was swept into the sea, at the mouth of the Boyne (near Bettystown). The Well is one of a number of "otherworldly" wells from legends in other parts of the country and is sometimes known as a Connla's Well or the Well of Segais. In 520AD, St. Finian established a monastic school at Clonard on the banks of the Boyne, about 8 miles west of Enfield, which became a distinguished seat of learning. The monastry existed up to the 12th Century. It is one of the earliest Christian sites in Ireland. At one time it is said to have had 3,000 students coming from all over Ireland and Europe. Twelve Irish Holy men studied there known as the twelve apostles of Ireland including St. Columcille (founder of Kells Abbey 554AD) and St. Ciarán (founder of Clonmacnoise Abbey 545AD). St. Finian died around 549AD from the yellow plague. Around 1177, Clonard became a Norman garrison town under the military occupation of Meath directed by Hugh de Lacy (who built Trim Castle) due to its strategic location on a principal road and bridge over the Boyne. A 12th century fortified motte-and-bailey constructed at the time is a well known landmark of the area. This was a ceremonial site which lies between Athlone and Mullingar, about 33 miles west of Enfield. It is believed to have been the site of an ancient palace, the home of the High King Tuathal Teachtmar in the First Century AD. Tuathal Teachtmar made a new division of Ireland at the start of the second century AD into the five Provinces of Leinster, Munster, Ulster and Connaught and having taken a portion from each formed the fifth Province or Kingdom of Meath. Today a great six foot high stone known as the "Aill na Mireann" (the Stone of Divisions) rests upon the hill signifying the meeting point of the provincial borders of the five kingdoms of Ireland and the gateway to the mystical Kingdom of Meath which held the other Provinces together. It is also said that the Mother Goddess Éiru of the Tuatha Dé Danann is buried under the stone. One version of the legend tells that the Milesians (sons of Míl Espáine and believed to be the Gaelic Celts) invaded Ireland from the Iberian Peninsula in the 2nd millenium BC. They were making their way from Kerry to Druim Cain (now Tara), when they were met by a Dé Danann army led by Éiru. Éiru was mortally wounded and while tending her, one of the Milesian sons, their leader and poet Amergin, then saluting her courage, promised Ériu that the country will continue to bear her name if they were victorious. The Book of Invasions (Lebor Gabála Érenn) tells that after they defeated the Dé Danann Kings (Mac Cuill, Mac Cecht, Mac Greine) on the plain of Tailtiu (a place between Navan and Kells), Amergin divided the country between his two surviving brothers, with Éremon, ruling the northern half, and Éber Finn ruling the south. The Slí Mór was a natural line of division. The Tuatha Dé Danann were given the underworld, which perhaps became the mythical land of Fairy Folk known as Tír na nÓg. As a likely seat of kings prior to Tara, the Uisneach site offered panoramic views over the central plain where from the summit you can allegedly see landmarks of 20 counties in Ireland. Uisneach was regarded as the natural centre of the country and the stone may be called the "Umbilicus Hiberniae" or the "Navel of Ireland". (This claim is contested by the Seefin Stone in Birr which claims to be the geographical central point of Ireland.) Uisneach is a festival site of Bealtaine fires and Druidical ceremonies, even attracting Egyptians who came up the Shannon over 2,000 years ago. It is reputed that the first fire ever lit in Ireland was lit here in May to usher in the first dawn of summer. Tara (about 18 miles north east of Enfield) was the ancient ceremonial seat of High Kings of Ireland. In the centre of the Royal Seat or "Forradh" stands a pillar stone called the Lia Fáil (Stone of Destiny) said to have been brought to Ireland by the mythical race known as the Tuatha Dé Danann and is one of the four legendary treasures of Ireland. (The Tuatha Dé are alleged to have originated from four mythical cities, Falias, Gorias, Finias and Murias and they are said to have brought one magical treasure from each city when they came to Ireland.) The Lia Fáil stone was said to roar with joy when, having completed his challenges, the rightful High King of Ireland touched it. The site had a massive Banqueting Hall/Area and may have catered for upwards of 1,000 guests. One of Tara's monuments is the "Mound of Hostages", a megalithic passage tomb whose construction and original use has been radiocarbon dated in 2001 to 3,350-3100BC. St. Patrick is said to have come to Tara to confront paganism when he began converting the Celts to Christianity around 432AD. Patrick famously lit his Paschal fire on the hill of Slane before the fire of the High King Laoghaire, thus breaking tradition, and so Patrick was challenged to a contest with the Magician Lucamael. When Patrick won the contest, King Laoghaire (said to be the last pagan king of Ireland), allowed him to bring Christianity to Ireland unopposed. King Laoghaire is said to have been buried at Tara standing up in his grave fully armed and facing South towards his enemies. Another legend maintains that the Ark of the Covenant, the vessel believed to contain the Ten Commandments and early books of the Bible, was brought to Tara, along with the Lia Fáil (suggested to be Jacob's Pillar) and Teia Tephi (daughter of the King Zedekiah of Israel) in 583BC by her Grandfather St. Jeremiah the prophet (believed by some to have been the real Patriarchal Saint of Ireland) before the fall of Jerusalem to the Babylonians and destruction of Solomon's Temple. She is said to have married King Eochaidh. Some interpret the texts of the Irish Dindsenchas to indicate that it is buried somewhere near the "Mound of the Hostages". Some of the area around the "Rath of the Synods" was excavated in 1898 by a group of British Israelites searching for the Ark before they were stopped. 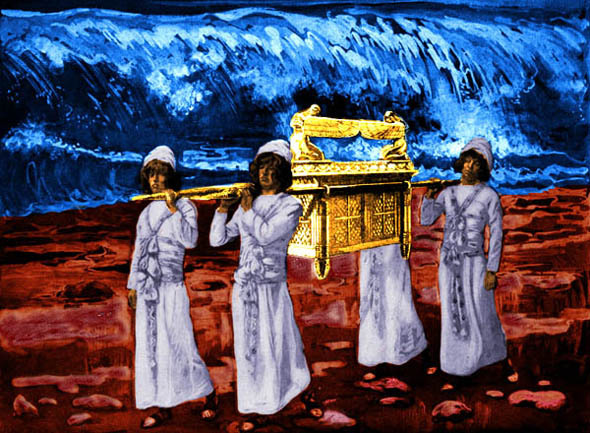 Some say the allegedly golden Ark of the Covenant may be responsible for the origin of the concept of a mythical Crock of Gold and that the origin of the title "Emerald Isle" is due to the Emerald birth stone of one of the lost tribes of Israel which allegedly migrated to Ireland. In a similar vein, the title "Emerald Isle" may also be derived from Goídel Glas (Glas = Green), the eponymous ancestor of the Gaels, and creator of the Goidelic (Gaelic) languages from an amalgamation of seventy two known languages under the instruction of Fenius Farsaid. In his youth Goídel was stung in the neck by a serpent, and was immediately brought to Moses, who, laying his rod upon the wounded place, instantly cured him. The word "Glas" was added to his name on account of the green scar left behind by the snakebite on his neck after the wound was healed. Goídel obtained a further blessing, that no venomous beast can live anywhere his future generations should inhabit. Brú na Bóinne is the site of an Ancient Temple and passage tombs dating back to the New Stone Age, constructed around 5,200 years ago. The Brú na Bóinne visitor Centre is about 31 miles north east of Enfield. On the Winter Solstice (21st or 22nd December), the light of the sun enters the roofbox at Newgrange and shines onto the floor of the inner burial chamber for 17 minutes. Mythology claims the Tuatha Dé Danann may have erected Newgrange as a burial place for their chief Dagda Mór. Legend claims it is also the place where Cúchulainn was conceived. There are also some stunning examples of megalithic art carved on the surrounding stones. Brú na Bóinne may also mean "Womb of the Moon". The layout of the entrance, passage and chamber of Newgrange may have a resemblance to the female reproductive organs. email: admin@enfieldonline.net to add a free link on this site to your local group website or page, or for inclusion in the Enfield Directory or with any GDPR issue. You can post information about local events, business offers and other notices and comments interactively on our Facebook Page, on Twitter or on the Noticeboard.